Is the Razer Mamba wireless supported by Razer Chroma™? 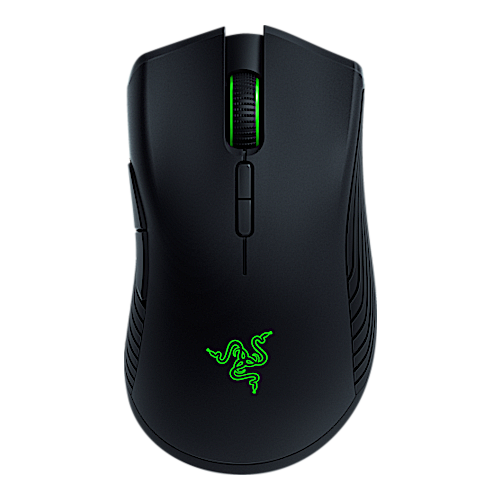 What Chroma lighting modes are available on the Razer Mamba Wireless? The Razer Mamba Wireless feature Spectrum Cycling, Breathing, Static and Reactive. Is Razer Mamba Wireless supported by Synapse 2 or Synapse 3? The Razer mamba Wireless is supported by Razer Synapse 3 Software. My Razer Mamba Wireless mouse doesn’t seem to be working properly. What can I do? Please download and install the firmware updater here. Does the Razer Mamba Wireless come with a braided cable? Yes, the Razer Mamba Wireless comes with Seven-foot, lightweight, braided fiber cable. Does the Razer Mamba Wireless have a tilt scroll? The Razer Mamba Mouse features 7 programmable buttons but does not feature a tilt scroll wheel. Does the Razer Mamba Wireless have onboard memory? Yes, the Razer Mamba Wireless has on-board memory. What is the form factor of the Razer Mamba Wireless? The Razer Mamba Wireless features the classic ergonomic form. How many buttons does the Razer Mamba Wireless have? The Razer Mamba Wireless has 7 hyperesponse buttons. What is On-The-Fly Sensitivity and how do I configure it? On-The-Fly Sensitivity allows you to set a button of your choice on the Razer Mamba Wireless to enable the feature. If a button has been assigned to "On-The-Fly Sensitivity," pressing and holding the assigned button down while moving the scroll wheel up or down will produce a bar on the lower right hand corner of your screen allowing you to adjust your sensitivity settings by steps of fifty(50) DPI. How do I change the settings of my Razer Mamba Wireless? To change the settings of your Razer Mamba Wireless– including changing keybinds, lighting, macros and other functions, please download and install Razer Synapse 3. 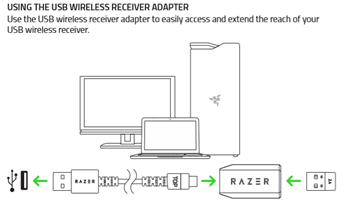 How do I use the Razer Mamba Wireless's USB wireless receiver adapter to extend the reach of the USB receiver? First seat the USB receiver into the adapter and connect that to the USB cable. Then plug the other end of the USB cable into your computer. Please refer to the image below for a visual image of the connections. What is the difference between the Razer Mamba Wireless and the Razer Mamba? One of the main differences is the Mamba wireless uses an Optical sensor as opposed to the Mamba's Laser sensor, enabling the Mamba Wireless to track speeds up to 450 inches per second (IPS). How many profiles can I store on the Razer Mamba Wireless and how do I select them? Up to 5 profiles from Razer Synapse 3 can be stored on the Razer Mamba Wireless Mouse. To toggle between the different stored profiles, press the profile button on the bottom of the mouse. The profile indicator LED will change color to show what profile has been selected. White indicates the active profile. Red is Profile 1, Green Profile 2, Blue Profile 3 and Cyan Profile 4. How do I get the best battery life and performance from my Razer Mamba Wireless? For optimal charging, the Razer Mamba should be set to the "off" position while in charging mode. Fully depleted batteries may not charge when the mouse is left in the "on" position. The Razer Mamba uses a high performance Lithium Ion battery. Unlike NiCad batteries, Lithium Ion batteries will not develop any type of memory and there is no need to routinely fully discharge your battery. In fact fully discharging a Lithium Ion battery can result in damage to the battery. If you are not planning on using your battery for an extended period of time it is best to store your battery just below a fully completed charge. It is not recommended to store your battery in a fully depleted/charged state. To prevent a slow discharge of your battery, it is best to always turn your Razer Mamba to the "off" position when not in use. Avoid storing your battery in excessive heat. Lithium Ion batteries prefer cooler temperatures. How long does it take to charge the battery of the Razer Mamba Wireless and how long does will the battery last? It will take up to 4 hours to charge the Razer Mamba Wireless. Once fully charged it will last up to 50 hours depending on usage. For the best charging performance, we recommend you plug the USB cable directly into your computer and not a USB hub. What is the button on top of the on/off button of the Razer Mamba Wireless for? This is a profile indicator. Your Razer Mamba Wireless is capable of storing up to 5 profiles from Razer Synapse 3. This means you can use your Mamba Wireless on systems that do not have Razer Synapse 3 installed. Your Razer Mamba Wireless can store your current profile temporarily until it is replaced with a new active profile. Pressing the Profile button will cycle from the current profile to profiles 1 to 4. The profile indicator LED will change its color to show which profile is presently selected. Where can I find the USB Wireless receiver for the Razer Mamba Wireless? The USB wireless receiver is stored in a compartment on the underside of the mouse itself. Simply remove the cover to store or remove your USB adapter. Can I change the batteries of the Razer Mamba Wireless? Are there replacement batteries available? No, the batteries cannot be changed within the Razer Mamba Wireless Mouse. When I use the DPI button on the Razer Mamba Wireless Mouse, what are the default DPI Settings? By default the DPI up and down buttons will go between 800, 1800, 4500, 9000 and 1600 DPI. These values can be customized within Razer Synapse 3.0. What is the wireless technology used with the Razer Mamba Wireless? The Razer Mamba Wireless utilizes 2.4GHz wireless technology in conjunction with the included 2.4GHz USB receiver. This is to indicate that your battery power is less than 5% and you should charge the mouse or connect the mouse to the USB cable. What comes out of the box of the Razer Mamba Wireless?